Your portfolio: You are a fund manager with a A$5 million holding in Commonwealth Bank (CBA). Assume CBA is trading at $30.00. Your market outlook: It is currently the beginning of July. You are basically neutral on CBA's share price over the next quarter, thinking it will probably range $1.00 points either side (i.e. between $29.00 and $31.00). Your objective: You wish to maintain your current market exposure, but would like to generate some extra returns. Given you expect no price rise beyond $31.00 you are prepared to cap your upside potential in exchange for adding some extra alpha. 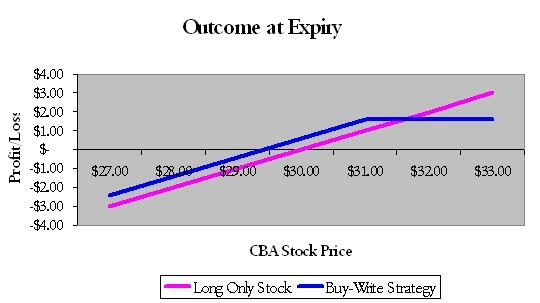 The investment strategy: Execute a buy write strategy over CBA using CBA exchange traded call options. Implementation: Hold the long exposure in the stock; sell CBA call options against the underlying equity position. The current stock level is $30.00, and the call options will be sold at a $31.00 strike. Equity options have a standard contract size of 100 shares per contract. Therefore a $5 million dollar holding equates to 166,666 shares at $30.00 or 1,660 option contracts. Outcomes: The table below shows call option values if the stock ranges between $29.00 and $32.00 on expiry. If the market stays neutral as expected: Because the option is sold at $31.00, any stock value at or below this level means the option expires worthless. The seller keeps the option premium and overall the buy write portfolio outperforms the stock alone1 . If the market falls: Where the stock is below the current level of $30.00 at expiry, then because the call option is sold at $31.00, any stock value at or below this level means the option expires worthless. The seller keeps the option premium and overall the buy write portfolio outperforms the stock2. Of course the long stock holding suffers, but is cushioned by the premium earned on the option. If the market rises above $31.00: Because the call option is sold at $31.00, any stock value above this level means the option will expire with some intrinsic value. By implementing the buy write strategy your profit is capped at 3160 ($3100 strike plus 60 cent premium received). Any rise in the market beyond 3160 will mean you have foregone profit and the buy write strategy will underperform. Note that in an absolute return sense, the upside market risk of the sold $31.00 call is offset by your holding in the long stock portfolio. The seller keeps the option premium regardless of the outcome. Above $31.00 the call options will be assigned on expiry. ASX equity options are American style so early assignment is possible. Please refer to the early exercise of options page for more information on the early assignment of options. Further, when exercised the option writer looses the stock when exercised. The upside of the buy write portfolio is capped (blue line), however it outperforms the long only portfolio (pink line) at every point below the cap. 1 all else being equal. 2 all else being equal.